The Wiener Prater is an amusement park for families, adults and kids with lots of entertainment. Vienna's symbol the Wiener Riesenrad (Giant Ferris Wheel) is open all year round, while other attractions in the Wiener Prater are open from March to October. The giant Ferris wheel here is the main attraction here and counts as Vienna's emblem. 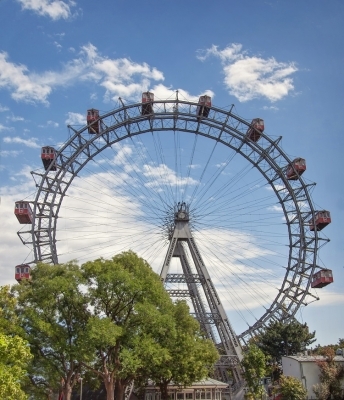 Made for the Jubilee of Emperor Franz Joseph I, in 1897, the wheel is still active today and is beloved for the amazing panoramic view you get to see of Vienna when you're at the top. The Schweizerhaus and Kolarik's Luftburg are the two most popular beer gardens in Vienna and usually packed when good weather.